Browse and Listen to The Complete Collection Here. Donald Carty the Artist & Writer. Donald is one of the best presenters of Personal Development information in the world. But he is also a man with a mission, to bring this key information for achieving success and fulfillment to the individual person who needs it most. The works of “Meditations & Spoken Word Inspiration” offer a plethora of data for the soul in it’s infinite journey. It’s soliloquy is a sublime meditative series of affirmations & thoughts , rooted in eternity. This tree has many branches & multi-colored leaves all flowing in the stream of light , energy & the power of love." Take a moment & let the power of this work draw you into a new reality. 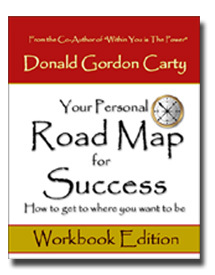 The Workbook "Your Personal Road Map for Succes - How to get to where you want to be." This powerful workbook will teach you how to make better use of your unlimited potential and become successful in all areas of your life. This is a "Practical" course which, in a short time, will guide you to the summit of the art of living and success. It has also been designed not merely to be read but to be "Experienced." Higher natural aptitudes have lain dormant inside you ever since you were very young. Now is the time for you to discover them.